Did you know that Henry Heinz, the “Pickle King,” plucked “57 Varieties” out of thin air? Henry Heinz had already driven a pickle company into bankruptcy by the time he was 25 years old. Arrested twice for fraud—and cleared—he managed to borrow $3,000 from relatives to once again enter the arena of the food business. He had several canned goods, but his best known products were pickles, which he used as a marketing tool. At the 1892-1893 Columbian Exposition in Chicago, he found himself with a remote location in the park. Undaunted, Heinz had a local printer make thousands of small white cards that offered a free pickle to anyone presenting the card at his booth. Located on a second floor, the Heinz booth had so much traffic that the fair officials had to strengthen the gallery floor. By the time the World’s Fair had ended, Heintz had given away one million pickles and schoolchildren begged for a Heinz lapel pin. Heinz, ever the marketer, appreciated the value of a “hook”—a slogan people could latch on to. 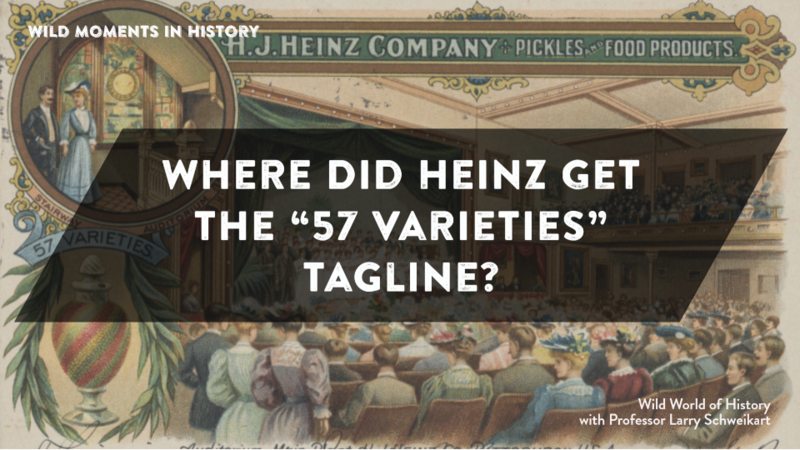 He recalled a shoe company that advertised “21 Styles of Shoes,” and Heinz immediately envisioned “57 Varieties” of pickles, even though by then he had over 60 different types. But 57 seemed to sound more authoritative. By then, he also had a nickname: The Pickle King. In 1900, Heinz was among the first to use electric lights in advertising, with a giant billboard in Pittsburgh. Throughout it all, Heinz remained a deeply committed Christian and closed his businesses on Sunday. He would not even allow ads for his vegetables to run in papers on Sundays. He served in the World Sunday School Association for most of his life. See Larry Schweikart, The Entrepreneurial Adventure.